As you may have noticed upon your travels my blog address and title were a little out of joint, unfortunatly I haven’t the money for an automatic redirect so this will have to suffice. It looks exactly the same, just it doesn’t say cakejakesnake up top! As you may have noticed there has been a distinct lack of posting over the last few weeks. In one sense I’m happy because I have quite a good excuse for not getting anything done for once ,however I’m not sure that the nasty scars on my face as a result of a rather unfriendly encounter between my face and Upper Clapton Road are worth it. I should probably mention here that I fell off my bike on the way to a blogging session and wasn’t in any sort of fight as it seems most people who’ve seen me have thought. 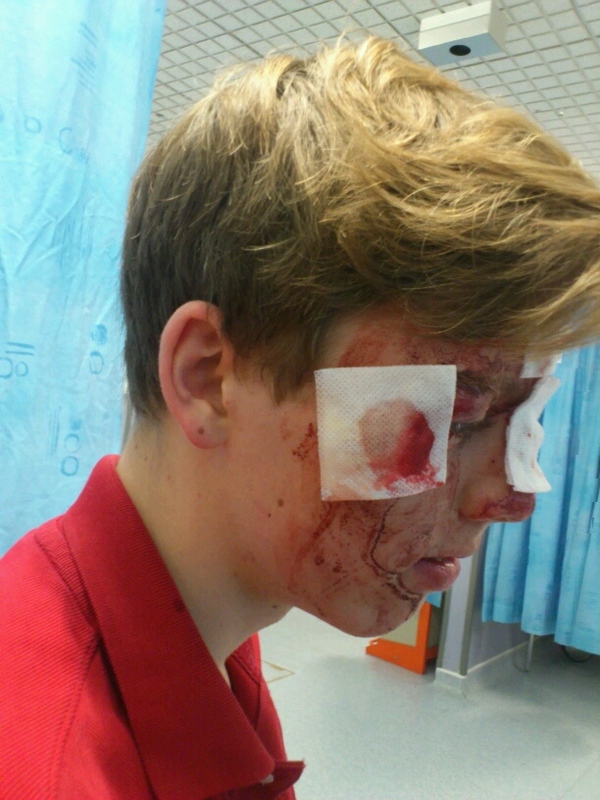 Anyway, a broken nose and six stitches later I am back and have plans to enter a worst injury of the month competition in my Dad’s cycling magazine. Here’s hoping for a ‘victory’ of sorts, I will of course keep you posted on the matter! At the core of the Olympics, alongside the values of friendship, respect, courage, excellence, determination, inspiration and equality, lies education. This fact is clear both in the Switzerland, at the Olympic Museum, and closer to home, through the efforts of LOCOG (London Organising Committee for the Olympic Games). During our visit we were lucky enough to meet Andy Martin and Emily Tuffin who work for LOCOG on the ‘Get Set Network’, which aims to use “the London 2012 Games to inspire learners of all ages and abilities to get involved in Values-based projects and activities.” An impressive set of aims, made more impressive by the fact that London seems to be the first Olympics with a real commitment to engaging it’s youth in a more meaningful way than a few cute faces in the opening and closing ceremonies. This desire for engagement is clearly shared by the IOC, our visit coincided with a week long set of activities for local school children that gave them a chance to be involved in some sports workshops. One of these was the archery course which we were lucky enough to try out (I was very good obviously!) The great thing about all of this was the fact that the sport was not the end of the story in fact it was just the beginning, the real focus of the program was imbuing the participants with an understanding of the Olympic values I mentioned earlier. In this way the Olympics can gain a far more universal appeal, certainly they are about competition, they’d be nothing without it, but for those whom competition is not the biggest draw activities such as the ones we saw in Lausanne and the ones that the Get Set Network run and encourage are key and can only be seen as a good thing despite any reservations people may have about the effect or methods of engagement. The sheer number of children who attend schools who are a part of the network is a guarantee that a significant number of kids are going to be engaged by the Olympics coming to the UK, and not just through seeing it on the television. As the Olympic ticketing process starts coming to an end, the final round of sales finishes on the 17th of this month, I feel it is time to vent a little frustration at reaction of the British public towards what has in reality been a fantastically successful campaign. The whole issue has, in a rather British fashion, been described variously as a ‘debacle’, a ‘shambles’ and ‘crazy’ by both journalists and the baying hordes of the British public. But has the whole thing been blown out of proportion? To my mind yes, it has, a rather simple bit of maths and an understanding of the ways in which people deal with ‘losing’ at anything tells us pretty that pretty quickly. In the first round alone 1.8 million people in the U.K applied for a total of 20 million tickets between them, no real surprise then that a few people are a bit miffed, there were only 6.6 million on sale in the first place. So that’s the maths out the way, now an even simpler part, human nature. Humans hate losing, obviously, this combined with the nature of the British media and its desire to find the ordinary man on the streets’ view on pretty much every news topic regardless of expertise has led to an inflation of the story and also a very lazy bit of journalism. Whack a camera or microphone on and head out on to the street, select the first twenty people you see, plonk them infront of your selected recording device and next thing you know you’ve got yourself a story! “Yeah I got all the tickets I applied for” is frankly a pretty mundane sound byte. Angry people on the other hand makes for a news story which appeals to the public because frankly they didn’t get any tickets either and that’s what the assembled editors behind the desks at pretty much every news outlet have decided will make the cut. Of course a large percentage of the tickets have gone towards corporate sponsors and of course that doesn’t sit particularly well with me either but, LOCOG aren’t the people who you should be getting angry at. In fact you shouldn’t be getting angry at anyone apart from whoever it was that created modern western capitalist society and I hear he or she is relatively difficult to pin down nowadays, since the financial crisis anyway. Yes that’s right, until we have a communist Olympics, entirely funded by government with taxes drawn from some sort of big imaginary pot of money which none of us have payed into and therefore can’t get angry about the use of, until every games is held in international waters and has a capacity for the entire worlds population to attend free of charge, until there are no longer any nations competing, just a bunch on identical athletes and until it is ‘just the taking part that counts’ someone is going to be unhappy with some aspect of the Olympics. So you know what, stop complaining and embrace the beautiful diversity; the hodge podge of different cultures, ideas and sports; successes and failures, because that is what the Olympics is all about it is an event which represents the human race at its best and worst all at the same time. That sinking feeling you felt when you didn’t get any tickets and the anger you feel at all those corporate sponsers giving their employees tickets for free is in fact a gift from LOCOG to you because they’re just the feelings that those athletes you’re going to be watching on the other side of the television screen will be experiencing.The ticketing process was the first real event of the London Olympics and you didn’t just get a seat, you were a competitor. Dodgy dealings and keep’m’sweet democracy? A worrying article this, no matter which Club you want to win the bid for the use of the Olympic stadium after 2012. Would seem some serious issues over the impartiality of Newham council have been raised. Do you believe that the Olympics are an event led by impartiality and a transparent system of command and control of funds etc ? Or are the Olympics a paradise of easily siphoned money and ‘legitimate’ bribery and corruption not strictly illegal but morally questionable and certainly not entirely transparent. Feel free to comment your views. This is a clip from a great Australian show called ‘The Gruen Transfer’ which I first got hooked on when visiting my Gran who lives over there. The basic premise being that two ad agencies are asked to ‘sell the unsellable’ , in this case changing the venue of the London Olympics to Australia. Today may mark a pivotal point in this blog’s history as I come scurrying back to wordpress with my tail between my legs from my experiences with tumblr, which havn’t been great. Seems they don’t like you to find adding in feeds or widgets very easily just yet, maybe in a couple of years it’ll be up to scratch but after my time using wordpress on a trip with AND to the Vancouver Paralympics last year tumblr seemed sort of prehistoric. Happy reading/watching and listening! The second of my later than expected posts now, this time the trip to ‘5 live’ and the chance to see a live radio show in action; ‘606’ a live football talk show airing on a Saturday and Sunday . After a nice loud and busy ride down the Central line to White City and a quick bit of spot-the-news-reader in reception we were led past the security gates and up into the beating heart of British Broadcasting, well Five Live anyway which was mostly desks, computers and those chilled water machines which are always so much fun to fiddle with. Once in the studio however everything looked pretty much exactly how I had imagined it, a large bank of computers with enough knobs and switches to last a lifetime. Then there was the production team, with headsets on and a million jobs to do it was great to see just how much controlled mayhem goes into producing the smooth and entertaining shows we’re all used to listening to. Past an incredibly thick layer of glass sat the hosts themselves, which with respect seemed to be the easiest job in the house, but stressful none the less, the energy in the studio was infectious though and by the end of my time in the studio I sort of wanted to get in there myself. After that we moved on to ‘call ops’ which was a little less glamorous but vital none the less, the job of the guys back here was to first speak to all of the people calling into the show and then to select the ones most appropriate for live broadcast which is perhaps unsurprisingly not that many!